Era Pods contain a special blend of BLOOM FARMS cannabis oil extracted with clean CO2 and made exclusively for PAX Era, an engineering marvel from the industry leaders in innovation. 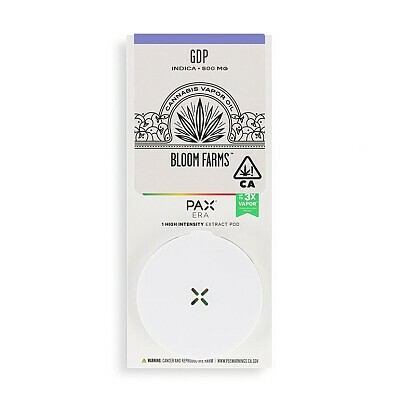 The superior flavor, consistency, and experience you’ve come to expect from BLOOM FARMS is now available with the cutting-edge technology of the PAX Era, which includes temperature and battery status LED interface, a sleek design, and the PAX Vapor app. Made from the highest quality materials, you never have to worry about the durability of an Era Pod, and thanks to the Era Pods’ smart click technology, enjoying all-natural BLOOM FARMS cannabis oil has never been this flawless. The offspring of world-famous Big Bud and Purple Urkle, indica-leaning Granddaddy Purple (or GDP) imparts the aroma of earthy berries. Its initial cerebral uplift and euphoric body buzz smoothly shift into the full-body deep relaxation indicas are known for. GDP is said to enhance mood, appetite and restful sleep, making it popular for evening use.